They say that you’re only as good as your last job, and that’s certainly true for the translation and language services industry. That’s why, at LKT, we pride ourselves on delivering top-quality translation services for all of our customers. 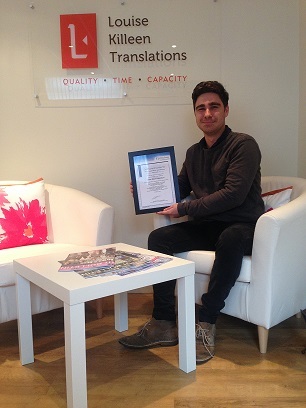 So we’re naturally delighted to report that our services are now certified to ISO 17100:2015 Translation Services – Requirements for translation services. Published in May 2015, the new ISO 17100:2015 supersedes the European standard EN 15038 and provides a framework that regulates the main processes, resources and procedures used by language service providers in their day-to-day operations. Unlike its predecessor, the new ISO 17100 standard is recognised across the globe, which means that customers the world over can rest assured that we deliver nothing but the best. All of LKT’s processes and procedures had already been aligned to the requirements of the old standard, so it didn’t take long for us to put together a body of evidence that shows our compliance with the new one. The external auditor paid us a visit on Wednesday, 23 October. He spent the morning with us looking over our systems and procedures, and tracking the progress of three example projects from enquiry to final delivery. Needless to say, he was very impressed with what he saw and was all too happy to submit a glowing report to the committee – with a special mention for our exemplary peer review system. We’d like to thank every member of our team, as well as our customers and suppliers, for their hard work and cooperation during the certification process. We’re thrilled to have official recognition of the quality that we’ve always prided ourselves on. You can read more about the new ISO 17100:2015 on the ISO website.